We work with independent stores to chains, universities to day care centers, mobile vendor trucks to NFL Stadiums, a small catered event to the Democratic National Convention, we have done it all! If your retail business is serving food to the public then we are the food safety consulting company for you. Berger Food Safety Consulting's services include but are not limited to: ServSafe Food Protection Certification, food safety audits, illness complaint investigations, HACCP plan development, liaison assistance with local health departments, plan review, food handler training and custom seminars, emergency certifications, food safety textbooks, allergy awareness certification, and allergy consulting. Our Food Protection Managers Certification class and ServSafe Certification Exam is designed to teach the food service manager all aspects of food safety and sanitation from purchasing and receiving food to serving the customer. Key issues are thoroughly discussed such as how time and temperature abuses, cross-contamination, and poor personal hygiene can lead to foodborne illness. Most importantly, the food service manager will learn how to avoid costly foodborne illness outbreaks. Other topics include: biological, chemical and physical hazards; food allergens; proper cleaning and sanitizing; waste and pest management; and the basic principles of HACCP, otherwise known as Hazard Analysis Critical Control Points. The full class format includes lecture/discussion,videos, activities and games to enhance student learning, encourage student participation, and foster an understanding of the importance of serving safe food. As soon as you register for a class each student is provided with a Food Safety for Managers textbook and a packet of materials related to topics discussed in the course. The video presentation to fulfill Massachusetts Allergy Awareness law is shown in this class, the $10 certificate fee is not included in the class - more details. Visually Impaired: We can provide training materials and verbal exams for qualified students. The food safety audit is an integral part of your quality assurance program. It's main purpose is to assure that you are in compliance with the most current regulations, prevent a foodborne illness outbreak, and protect your restaurants and its mangers from legal action in the event of an outbreak. It serves to highlight areas in need of improvement that managers and owners often overlook because of their heavy work loads. Did you know that of all the foodborne illness complaints to the health department, 73% of those complaints blame a restaurant as the cause of their illness. 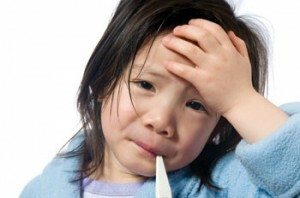 In reality, of all confirmed cases of foodborne illness, only 30% are a result of eating in a restaurant. By having a complaint formally investigated, you demonstrate to your customer that you take their complaint seriously and that you are commitment to providing the safest, highest quality food. The Complaint Investigation is a two part process. The first of which is interviewing the individual who made the complaint. The interview will illicit important information such as date and time of the meal and of the onset of illness; type and duration of symptoms; whether or not medical care was sought; and menu items consumed. The second part is the environmental investigation. This involves inspecting the food establishment. The focus of this inspection will be of those food items suspected of causing illness: where they were purchased, how long they were in storage, who prepared them, what ingredients were used, what cooking temperature were used and how long were they cooked, and how long they were held before service. HACCP (Hazard Analysis Critical Control Point) is a prevention based system to assure food safety. It is used throughout the food industry whether is be on the farm, in a manufacturing plant, or in a retail operation. It is a system that identifies and monitors hazards to food and identifies key processes in the flow of food where these hazards can be controlled. A HACCP plan is required for sushi restaurants or establishments that: conduct vacuum packaging, smoking or curing meats or fish, or using "time as a public health control", just to mention a few. A HACCP plan is the written documentation and is based on seven basic principles: 1. conducting a hazard analysis; 2. determining the critical control points to reduce or eliminate the hazards; 3. establishing critical limits for each critical control point; 4. establishing monitoring procedures; 5. establishing corrective actions; 6. establishing verification procedures; and 7. keeping records. Do you need training in HACCP plan development? Are you looking for an introductory food safety seminar for new employees? Do you have a few employees in need of personal hygiene training? Any type of food safety and sanitation seminar can be developed depending on the needs of your facility. 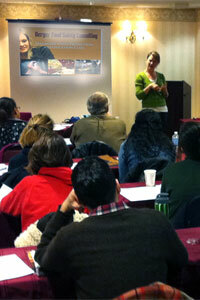 Our most popular seminar is our "Food Safety 101" seminar for all new and experienced food handlers. "Food Safety 101" reviews food safety basics such as how to prevent cross contamination, proper personal hygiene, safe temperatures and proper procedures for cleaning and sanitizing. We also have a program for non-managerial staff that would benefit from a hands-on training rather than sitting in on a seminar. We call it, “Hands on!” We will come in and “show” your staff how set up a work-station or specific area so that he or she can perform their duties in a safe and sanitary manner. This can include showing new staff how to set up a three bay sink and how to use chemicals properly. It may include hand washing demonstrations or instructions on how to calibrate and use a thermometer. This training can be customized to your needs or can be one that covers your establishment from front to back. If you have been shut down or your permit has been suspended for food code violations or have "trouble" with the health department, we can help you by working with you and your health inspector to solve the problems. 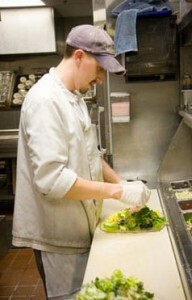 Often, the solutions include representing you in an official hearing at the health department, certifying additional managers in Food Protections courses, conducting "Food Safety 101" training for your staff, and providing food safety audits that are used as training tools for you and assures compliance with the food code for the health department. We offer full plan review for new construction or remodel of existing restaurants. A thorough plan review is essential in making sure that you are in compliance with all health department requirements and therefore avoiding costly and timely mistakes. By reviewing and making recommendations for architectural plans, food service equipment, menus and all sanitation policies, we can identify potential problems BEFORE costly purchases, installation and construction begins. Not only can we review your plans for accuracy and compliance, but we can assist with health department approval by representing you during the entire process. Our own Food Safety for Managers textbook for any managers certification exam as well as ServSafe training supplies. We now offer online exams for food safety certification. Online results are available at the time of testing to provide immediate certification. General consulting services are available as needed. If it has anything to do with food safety we can solve the problem. We can make sure you are serving the safest food possible in the least intrusive way possible. Please call to inquire.